Los Olivos and the surrounding Santa Ynez Valley is a unique area blending rich history with modern luxury and natural beauty. 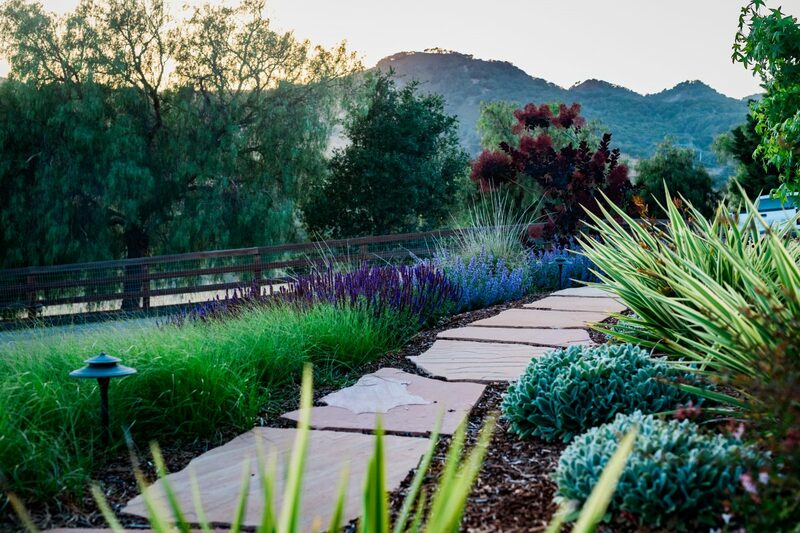 The landscaping at your Los Olivos home, winery, or business should reflect the stunning scenery and upscale charm of northern Santa Barbara county. Wild Bloom is a team of designers and craftspeople dedicated to creating unique and sustainable outdoor spaces for you and your guests to enjoy. Many of our landscapes include features such as low water native plantings, naturally inspired hardscapes, outdoor living areas, decorative landscape walls, vertical gardens, and just about anything you can dream up. Due to the dry climate and fragile ecosystems, landscaping in Los Olivos requires a special understanding of sustainable design and building techniques. We work with you to determine the best ways to reduce the impact of your outdoor space while maximizing the functionality and aesthetic beauty of your property. Native plants, low water lawn alternatives, permeable hardscapes, rainwater harvesting, and smart design choices make your landscaping easy to maintain and drought-tolerant. Combined with an upscale artistic touch, our sustainable approach to landscaping gives you a low impact and beautiful outdoor space to relax or entertain guests. Click here to learn about drought-tolerant landscapes.